"A delicious and refreshing salad that is perfect for the summertime. It is ideal as a light lunch or side. A tangy salad with a kick!" Whisk rice vinegar, honey, ginger, soy sauce, wasabi paste, and sesame oil together in a bowl until vinaigrette is smooth. 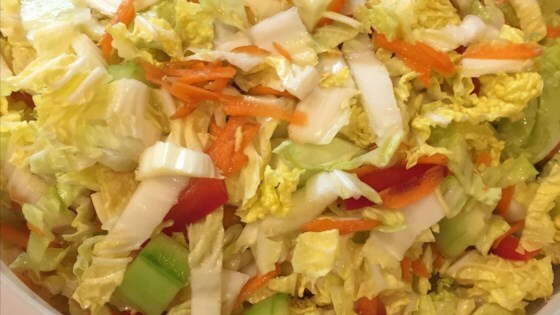 Combine cabbage, cucumber, red bell pepper, and carrot in a large bowl. Pour vinaigrette over cabbage mixture and toss. Refrigerate for 1 hour. Heat a skillet over medium heat; cook and stir sesame seeds until toasted, 3 to 5 minutes. Garnish salad with toasted sesame seeds and avocado.